Luke 2:16-20: And they came, having hasted, and found both Mary, and Joseph, and the babe lying in the manger, and having seen, they made known abroad concerning the saying spoken to them concerning the child. And all who heard, did wonder concerning the things spoken by the shepherds unto them; and Mary was preserving all these things, pondering in her heart; and the shepherds turned back, glorifying and praising God, for all those things they heard and saw, as it was spoken unto them. This small, jewel-like devotional painting, commissioned by Filippo di Averardo Salviati (1513-1572), was most likely destined for a private chapel in the Salviati villa. This painting displays extreme refinement of execution and luxury of materials characteristic of Florentine Mannerism, with 'disegno' (drawing), sculptural modelling of forms, and enamel-like finish apparent in every detail. 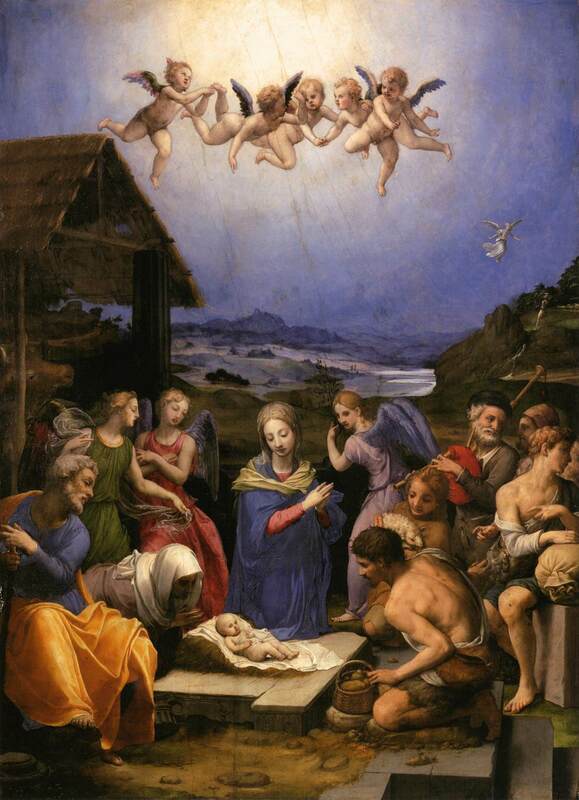 The entire upper half of the composition is a deep landscape of lakes and hills, above which stretches a vast blue sky that Bronzino painted in expensive lapis lazuli. To the right, an angel announcing the birth of Christ to a single shepherd hovers in the sky, and in the foreground five putti fly in celebration directly over the Nativity scene. Agnolo di Cosimo (1503 – 1572), more commonly known as Il Bronzino, or Agnolo Bronzino, was an Italian Mannerist painter from Florence. His sobriquet, Bronzino, in all probability refers to his auburn hair, or possibly derived from his having a dark complexion. He was court painter to Duke Cosimo I de Medici for most of his career, and his work influenced the course of European court portraiture for a century. Cold, cultured, and unemotionally analytical, his portraits convey a sense of almost insolent assurance. Perhaps it was these qualities which worked against him as a religious painter as his paintings have been accused of lacking real feeling leading to empty, elegant posturing.